Many gamers started out their RPG careers with a box set, be it the legendary Brown Box of Original Dungeons & Dragons’ fame or Paizo’s Beginner Box forPathfinder. (In fact, one of yr. humble editor’s earliest RPG purchases was the Dragonlance Fith Age Saga System box set from TSR.) Indeed, Wizards of the Coast has called back to the old Brown Box (and Red Box, White Box, etc.) with its recent D&D Starter Set for Fifth Edition. The Newsletter reached out to Rogue Comet with some questions about this ambitious approach to launching a new RPG line and received a very quick and thorough response from Stan Shinn of Rogue Comet, a long-time RPG gamer and professional digital and print design specialist. We’ve edited some of Mr. Shinn’s answers (and some of our questions) for length. Newsletter: Is your primary goal here to provide a nostalgia product for existing gamers, or an outreach project for them to use with new gamers, or somewhere in between? Rogue Comet: The product targets both old and new gamers, but has the side effect of providing a great shot of nostalgia! If you look at the Mentzer Red Box, it did an amazing job of teaching folks who’d never heard of roleplaying how to play the game. 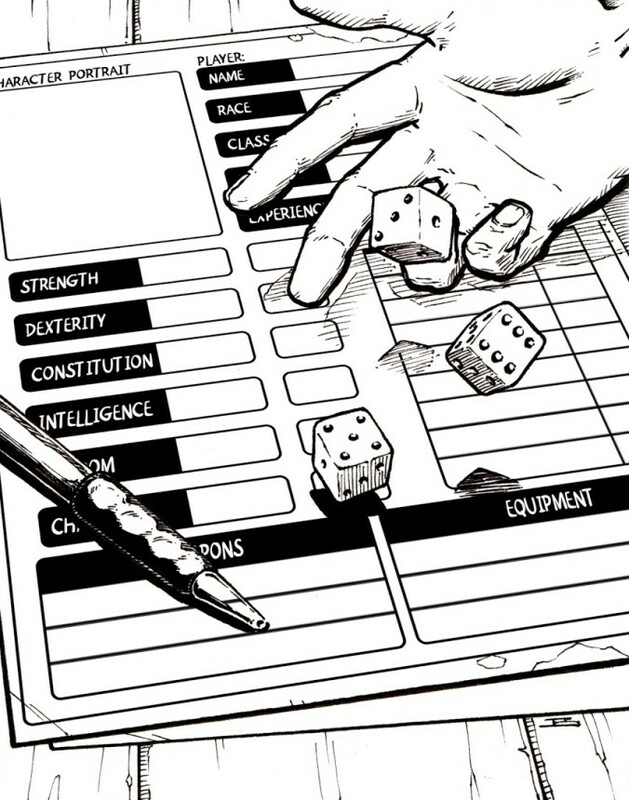 In the Dungonesque RPG, I do spend time on giving folks an introduction to roleplaying (for example, we have a solo adventure which I think you’ll find great fun). However, people learn differently in today’s world than they did back in the 80s. In Dungeonesque I’m assuming that if you really want a lot of tutorials on roleplaying that you’ll pick it up by playing games or watching Youtube. So I tend to be brief and to the point with the rules, acknowledging that most of my customers will be veteran gamemasters. So is the booklets and boxes format just for nostalgia? Surprisingly, no. The starting point for me was the ergonomics of what game format many people want during the game. Our box sets were designed for function, but have the added benefit of invoking nostalgia for those original box set games. For me, there’s something special about opening up a box set and pulling out slim booklets to run [a] game. Newsletter: Why did you choose 5E for this quasi-OSR project instead of using the already-streamlined BD&D or similar ruleset? Rogue Comet: I love the old D&D games! I started playing the White Box D&D version back in 1978, and I’ve played all the versions of D&D at some point. In the last decade I’ve also enjoyed playing retroclones like Swords & Wizardry White Box. 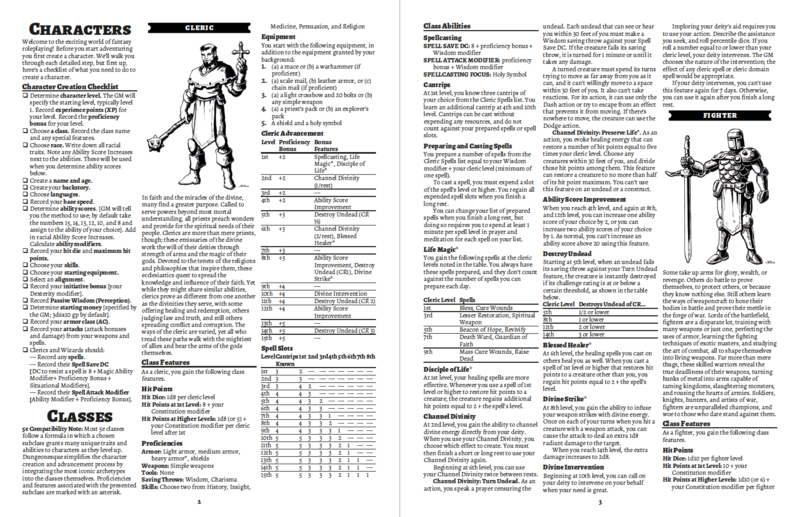 The early D&D games are great fun, but I really appreciate the innovations of recent years like Ascending Armor Class and Advantage as well as the story mechanics that 5th Edition D&D introduced such as Backgrounds and Inspiration. I started playing 5th Edition D&D the first weekend it was in beta (back when they called it ëD&D Next’) and it is my favorite edition of them all! For me, some flavor of D&D 5e is the game I most want to play. I’m making the Dungeonesque products because I want the 5e rules and adventures optimized for old-school play. 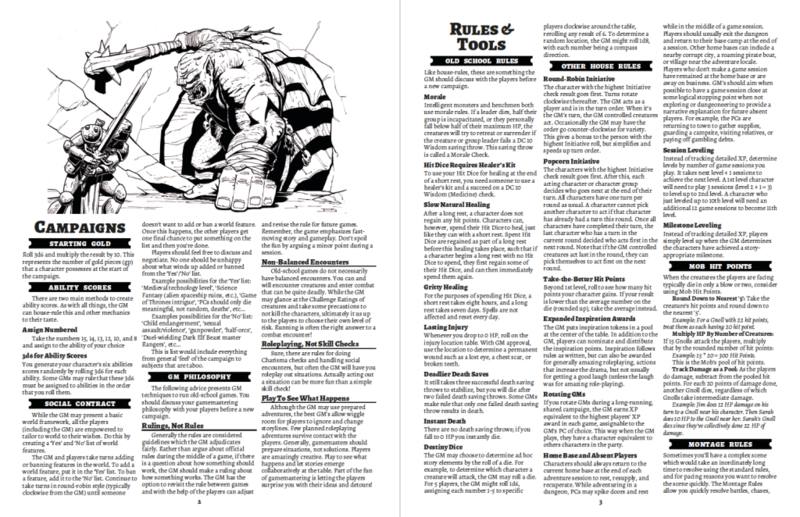 Newsletter: Along those lines, how have you streamlined the 5E rules? Rogue Comet: There were a few frustrations I had at my game table I wanted to solve. The 5e Dungeon Master’s Guide is 320 pages. An amazing book, but the content was a mix of things you’d use in between games, things you might never use, and some content you’d want to reference during the game. Pausing an RPG game I’m running to wade through 320 pages took too much time. I wanted something optimized for in-game use. 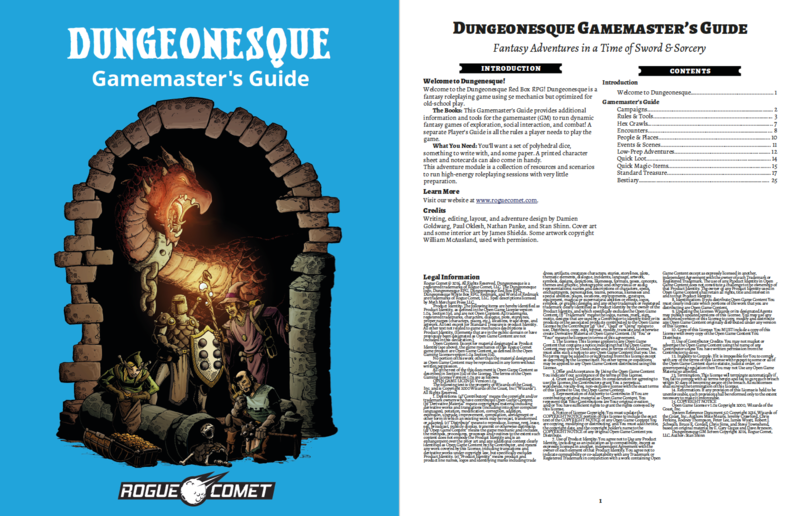 The Dungeonesque Gamemaster’s Guide will be under 50 pages, and the content is laser-focused on tools you can quickly reference and use during the game. Another issue is cost. I know a lot of gamemasters are like me, where you end up buying most of the game books for your players. This is one of the things I’ve always loved about Savage Worlds — you can buy their basic gamebook for around $10, cheap enough to buy several copies without breaking the bank. 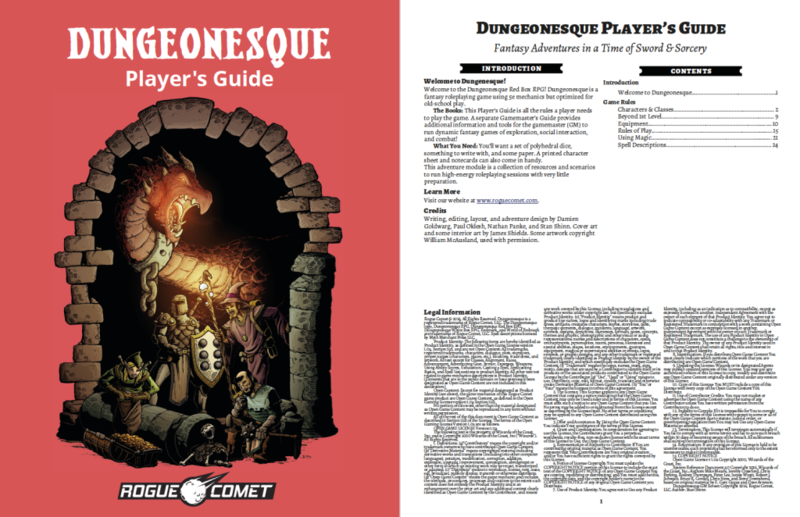 Likewise, I’ve designed the Dungeonesque Player’s Guide to be inexpensive (buy several and hand them out like candy!) and approachable (simple, short booklets give you all you need to play). Compatibility is also very important to me. You can mix and match Dungeonesque products at the same table with D&D 5e products. The rules are the same and they all work together. Overall, the Dungeonesque Red & White Box Sets represent an interesting fusion of the advantages of modern game design, crowd-funding, and direct-to-consumer sales in the form of a product that is explicitly designed to help bring new RPG players into the hobby. Rogue Comet’s campaign runs through July 20. Spell Formatting — We need a few tweaks like adding Icons for the concentration spells. Spell Listing — We’ve include all levels 1-8 spells, but some of these aren’t needed for our four classes. We’ll be removing some spells. Also, we had feedback that you might like the spells grouped by level — usually I see spells simply alphabetized so we’ll see what you think of this new format (and we can change it back to the way most people list spells). Standard Treasure — We’re leveraging some OGL White Box era retroclone content and some of these treasure items need better 5e stats, need to refer to the proper 5e spells, etc. We’ll be sending out a survey in the next two weeks to get your feedback. You can also email stan@roguecomet.com if you’d like to chat with me directly. A Choose-Your-Own-Adventure dungeon (released as a separate product since it won’t fit in the 44 page limit for DriveThurRPG booklets). An OpenOffice Cover Kit to hack different covers for your PDFs for do-it-yourself printing. We’re also thinking about what to put on the back of the book covers for those who get the physical products. Maybe things like a Table of Contents and Frequently Used Tables. We’ve love your feedback on this! We’ll give you another update on progress around mid-June after the survey on when we expect to have the final PDF and print copies ready for distribution. Thank you for your feedback and support! Let me know if you have questions. Here is the survey for the 2nd Playtest packet that went out on April 29th. Would love to get your feedback! The 3rd playtest packet will drop later this week to seek feedback on a few specific items before we release the final PDFs. We’re targeting May 31 (next Tuesday) to release the final PDFs. We’ll then have another couple of weeks to get additional feedback before we lock down the files for the print-at-cost versions. We’re targeting to deliver the print-at-cost versions by the end of June. Above is an example of some of the new art we’ve commissioned for the final product. We’re looking forward to completing layout and showing you the final products very soon!